Hey, guess what? We’ve made it half way through the Alphabet Challenge already. That went quick didn’t it! But even though we’re half way through the “Family History Through the Alphabet Challenge, if anyone new wants to join in please feel free to do so. Join us for one or two letters, or the rest of the alphabet, whatever works for you. 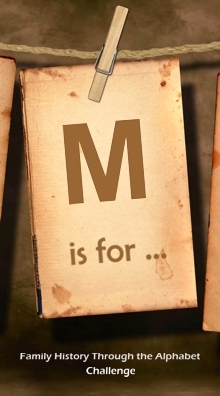 As with each week, the one rule of this Challenge is that you need to use the current letter of the week and connect it to someone or something relating to your family history, and this weeks letters is ‘M’. So a place, a person, or a thing relating to family history that starts with the letter M! We will list all posts from fellow geneabloggers for the letter “M” below. If you’re a tweeter, and wish to contribute or just follow the topic, follow the #fhalphabet hashtag. On Facebook, you can comment under each letter’s post. Are My Roots Showing?, M is for … MYSTERY! Can’t believe that I’ve Managed to keep up with the challenge!